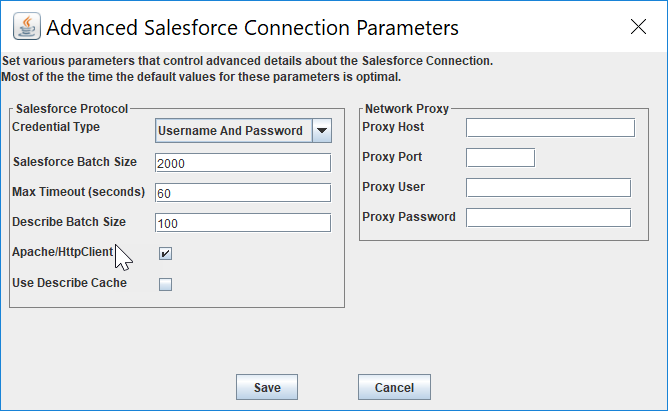 The Main Tab is used to manage connection information and credentials for Salesforce and the target database. Specifies the type of target database. Available database targets depend on the version of CopyStorm you have installed. 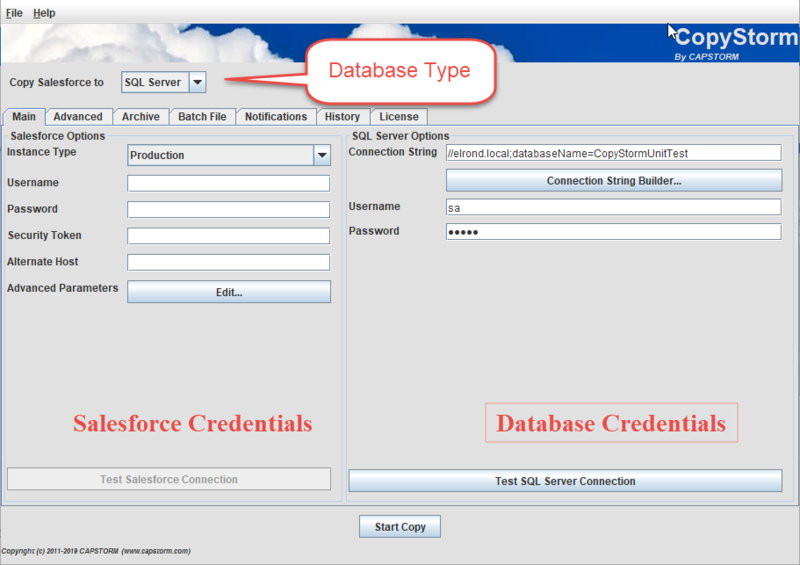 Instance Type Type of Salesforce instance being copied. Username A Salesforce user. This user must have API privileges. All data visible to this user will be copied to the CapStorm database. Password The password for the Saelsforce user. Security Token Optional security token supplied by Salesforce. Credential Type Technique used to find the Salesforce password. The default, Username and Password, stores encrypted credentials in a project’s .copyStorm configuration file. Salesforce Batch Size Default number of records to read from Salesforce in a single batch. The default, 2000, is the maximum supported by Salesforce and should not be changed unless the host machine has severe memory limitations. Decreasing this value will increase the number of API calls to Salesforce. Max Timeout Number of seconds to wait for a response from Salesforce. Describe Batch Size Number of table descriptors to read from Salesforce in a single batch. Apache/HttpClient If checked then the Apache/HttpClient will be used to communicate with Salesforce instead of the technique built into the the WSC library. It is unusual to need the Apache/HttpClient. Proxy Port Optional port on which a proxy host is listening. Proxy User Optional user name when a proxy requires it. Proxy Password Optional password when a proxy requires it. Connection String JDBC connection string required to create a CopyStorm database. Connection String Builder Clicking on this button launches a dialog that helps create a valid connection string. Schema Default schema to use. Note that this parameter is not supported by all databases.